It offers a brief overview of what Trade Facilitation is and how countries should go about it. Over the last few decades, countries have made significant progress in lowering trade tariffs and dismantling quota systems. International trade has increased and manufacturing has become more global, with developing, emerging and transition economies connecting with international supply and value chains in terms of both their exports and imports. The worldwide distribution and sourcing cycles, along with just-in-time and just-in-sequence logistics services and the emergence of e-business, has created pressure on governments to ensure efficient, fast and reliable border crossing and clearance procedures. Governments started to realize that their export economies heavily depend on efficient import processing, hence the need to have a holistic approach for a more efficient management of end-to-end trade transactions. Lack of transparency about rules and regulations, redundant and lengthy clearance processes, and multiple documents requirements in different formats and with different data elements, increase the costs and time of doing trade. Today these obstacles are seen as posing greater barriers to trade than tariffs and quotas do. They are “thickening” the border of countries (Wilson, Norbert 2007). Hence, it is more important than ever to achieve trade facilitation to enhance administrative efficiency and effectiveness, reduce costs and time to markets, and increase predictability in global trade. The primary goal of trade facilitation is to help make trade across borders (imports and exports) faster, and cheaper and more predictable, whilst ensuring its safety and security. In terms of focus, it is about simplifying and harmonizing formalities, procedures, and the related exchange of information and documents between the various partners in the supply chain. For UNECE and its UN Centre for Trade Facilitation and Electronic Business (UN/CEFACT), trade facilitation is “the simplification, standardization and harmonization of procedures and associated information flows required to move goods from seller to buyer and to make payment”. Such a definition implies that not only the physical movement of goods is important in a supply chain, but also the associated information flows. It also encompasses all governmental agencies that intervene in the transit of goods, and the various commercial entities that conduct business and move the goods. This is in line with discussions on trade facilitation currently ongoing at the WTO. There are great potential gains from trade facilitation for both governments and the business community. Public entities will profit in terms of enhanced trade tax collection, better use of resources and increased trader compliance. A more efficient and transparent delivery of public services will allow the administration to maintain high security levels and effective government control, while diminishing opportunities for corruption. Traders will gain in terms of higher predictability and speed of operations and lower transaction costs, resulting in more competitive exports on global markets. For countries as a whole, reducing unnecessary delays and costs attracts investments, and supports growth and job creation. Trade facilitation measures can particularly benefit developing countries, where it frequently takes three times as many days to export goods as it does in developed ones. Exports from developing countries require nearly twice as many documents and six times as many signatures (World Bank: Doing Business 2012). Implementing trade facilitation reform programs certainly has a cost, and facilitation measures need to be prioritized in order to maximize benefits. However, there are rich opportunities for gains, as documented in many studies and reports, particularly from the World Bank and the OECD. At the macro level, these look at the positive effects on the trading environment and trade volumes. Every extra day required to ready goods for import or export decreases trade by around 4.5% (OECD 2011). For the APEC region, reforms in countries that perform below the regional average could increase intra-APEC trade by 245 $billion. A recent WB research (Helble, Mann, Wilson 2012) on aid effectiveness finds that $1 of aid for trade facilitation translates into $70 in exports for recipients. At the micro level (firms), these studies assess the ease of doing trade and a firm's export performance, measured as export intensity and diversity. And they find that exporters in African countries with more efficient Customs agencies send more products abroad (Yoshino 2008). 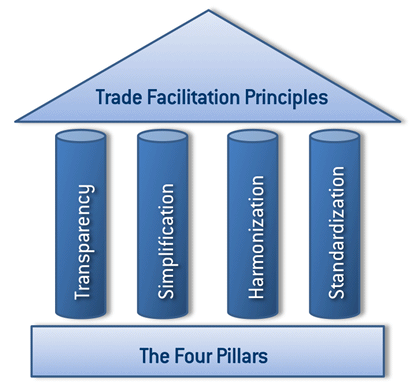 The fundamental principles of trade facilitation are transparency, simplification, harmonization, and standardization. Transparency within government promotes openness and accountability of a government's and administration's actions. It entails disclosure of information in a way that the public can readily access and use it. This information may include laws, regulations and administrative decisions of general application, budgets, procurement decisions and meetings. Regulatory information should be published and disseminated, when possible, prior to enforcement to allow parties concerned to take note of it and make necessary changes. Furthermore, relevant stakeholders and the general public should be invited to participate in the legislative process, by providing their views and perspectives on proposed laws prior to enactment. Simplification is the process of eliminating all unnecessary elements and duplications in trade formalities, processes and procedures. It should be based on an analysis of the current, “As-Is”, situation. Harmonization is the alignment of national procedures, operations and documents with international conventions, standards and practices. It can come from adopting and implementing the same standards as partner countries, either as part of a regional integration process or as a result of business decisions. Standardization is the process of developing formats for practices and procedures, documents and information internationally agreed by various parties. Standards are then used to align and, eventually, harmonize practices and methods. To achieve these principles, full cooperation between government authorities and with the business community is essential. Often activities promoted and conducted under the overall heading of trade facilitation focus on Customs administrations. Although Customs is a key player in trade facilitation, focusing on these agencies and their processes alone is not sufficient. Trade facilitation has to encompass the entire trade environment, actors and processes involved in a transaction. An international supply chain perspective should be adopted. A supply chain embraces all activities necessary for goods to be produced and delivered to the final consumer. Such activities include sourcing of raw materials, preparing for transport, requesting an import license, preparing documentation for Customs clearance, clearance, payment, and delivery to the consumer. As a minimum, a supply chain involves two parties, the seller and the buyer. In reality, a supply chain involves many different parties. These can be private-sector traders, transport operators, service intermediaries, or regulatory bodies from the public sector. Adopting a supply chain perspective makes it possible to view and understand all possible processes and the interlinkages between them. It provides the framework to logically connect different actors, procedures and requirements in one picture of the trade environment. In emphasizing the dependencies, it becomes clear that improvements are realized throughout the chain but changes in one area can easily be offset by stalemates in others. There are many variants of supply chains. Using a supply chain perspective therefore requires the use of a theoretical pattern that simplifies its complexity and can be used as a reference model.The Buy-Ship-Pay Model (BSP) developed by UN/CEFACT is an example of such a model. It presents the supply chain as a sequence of business processes that can be grouped into the high-level domains of Buy, Ship and Pay. The figure below illustrates the use of the BSP approach. For each domain, the model presents key activities, such as the activity “insure cargo” for the step “prepare for export” of the Ship domain. The model can be used in various ways, for example to gain understanding of the processes and actors involved, to help define the scope of a specific project, and to identify the impact of given trade facilitation initiatives and instruments. People: Capacity building of implementing managers and officers. A reform and modernization program can involve a single administration, e.g. Customs, or cover more than one government entity, in particular when the program addresses whole-of-government border management and single window implementation. In any case, a reform and modernization program has to involve the private sector from the outset, because such programs have to support the business community and improve the overall competitiveness of the country. To ensure a proper business orientation and also to inform the private sector about the change, training and investments required on their side, regular and formal consultation and cooperation is indispensable. Developing countries are at different development stages, have individual national priorities and operate in different legal and administrative environments. For these reasons, each of these countries need to determine the trade facilitation measures they want to implement, the scope of each measure, and in which order they should be implemented. This agenda and priority setting is part of the political process that starts with a comprehensive needs assessment, is followed by an analysis of the implementation options and solutions, and leads to the planning, monitoring and evaluation of the actual implementation of the reform and modernization program. Trade facilitation indicators help managing the reform process. For the “Legal”, “Technology”, “Process” and in parts “Organization” dimensions of a reform and modernization program, the TFIG provides a full range of implementation guidelines based on international standards and best practices. For the “People” dimension as well as the institutional development aspects of such a program, the World Customs Organization developed recently the “Organizational Development Package”, which provides tools and instruments for organizational and human resource development, integrity and stakeholder engagement activities. The need for strong political support and a professional and robust program and change management organization to drive such large scale reform has been described in detail in chapter 12 “Managing organizational change in border management reform“ of the World Bank publication “Handbook for Border Management Modernization”.